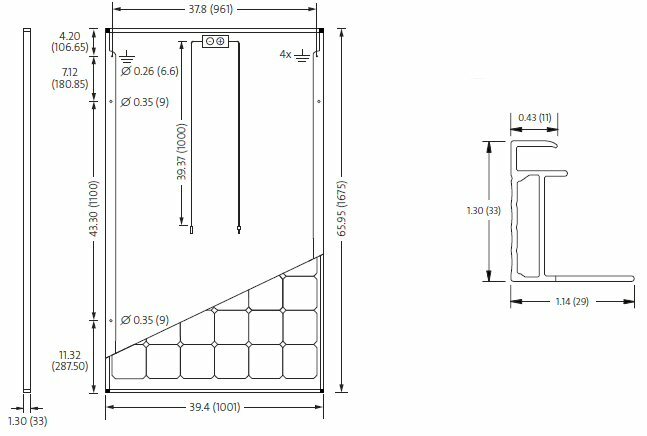 The SolarWorld Sunmodule SW 290 Watt (33 mm frame) solar panels now come with 5 busbars (vs. 3). Read our Blog on why this means more power for you! SolarWorld has a process with their solar panels called "plus-sorting". They test each solar panel as they come off the manufacturing line, and are then sorted in 5 watt increments. Only panels with a flashed power that is greater than or equal to the nameplate rated power are delivered. They are rounded down to the nearest 5 watt increment. So a 290W panel could be anywhere from 290W to 294.9 watts. This ensures you are getting the highest system efficiency and saves you the time-consuming chore of sorting the solar panels at the job site. The patented box channel frame design provides extraordinary stiffness in bending and torsion. The laminate with 4mm glass is set deep in the frame channel and secured with precision applied adhesive. The frame is assembled by press fit to maximize strength and longevity. The result is an extremely robust package that can be mounted in any orientation and can withstand static loads of up to 113 psf on a standard two-rail mounting system. Read our informative blog "How Do I Read the Solar Panel Specifications?" * Max Reverse Current of this module is 25A. Reverse current is used for calculations and sizing of fuses and breakers. This is subjective - as this can be calculated based on 80% of the max, or 90% of the max etc. Therefore depending on how the fuses/breakers are sized, this module can handle a maximum of 25A of reverse current. **Frame compatible with both "Top-Down" and "Bottom" mounting methods. Grounding locations - 4 locations along the length of the module in the extended flange. Due to continuous research and product improvement the specifications in this Product Information Sheet are subject to change without notice. Specifications can vary slightly. For installation and operation instructions, see the applicable manuals. No rights can be derived from this Product Information Sheet and SolarWorld AG assumes no liability whatsoever connected to or resulting from the use of any information contained herein.